When we moved to South Sprigg Street in the late 50’s, the new fad for Christmas at that time was the ALUMINUM CHRISTMAS TREE. We had one. We also had the light that sat next to it on the floor that shone on the tree to change the color from red to green to blue. Any of you who grew up in the 50’s and 60’s are probably familiar with this type of tree. When I was a kid I thought it was cool. Now it sort of makes me laugh. It kinda’ looks like somebody went nuts with the Reynolds Wrap and a pair of scissors. But it was the “in” thing at the time. I think maybe those trees are making a come-back now, since the “in” thing now is to be “retro”. 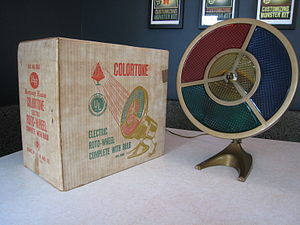 I guess maybe I am rather “retro” now too come to think of it – old, out of style, but interesting and cool. I think we must have moved from Fairview Place to South Sprigg close to Christmas time because I was immediately added to a children’s choir at May Greene School to sing Christmas songs for the Christmas Program. I didn’t know any of the words to the songs and did not have time to learn them before the program was held. The music teacher just assumed that everyone knew the familiar Christmas songs. The night of the Christmas program I felt rather awkward, pretending I knew the words to the songs with the gym full of families and teachers watching. My lip-syncing did not match the music at all except on some of the choruses. When we moved to South Sprigg Street, I began to attend Southside Baptist Church along with other kids from the neighborhood in those days. As I wrote in an earlier article, Charlie Dietiker picked us up on Sunday mornings and took us to church in his panel van. (Charlie Dietiker, Grocery Store Owner) There was a Christmas play every year and a visit from Santa. Santa gave each of us kids a stocking with an orange and some candy inside. But I wasn’t buying the Santa Claus thing. I knew that Santa was a fake. 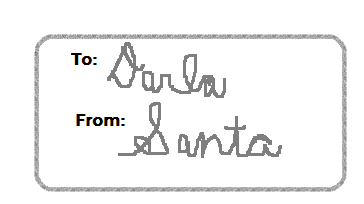 I had figured that out long ago because the presents under the tree labeled “From Santa” were written in my mother’s hand-writing. Santa isn’t real. Mom just says he is real. We never see him deliver the gifts. From then on I had all of those invisible characters categorized into one slot in my mind, “Made-Up Stories that we pretend are true”. I went along with the game. But I knew it was just all pretend. Now it wouldn’t really have mattered so much knowing that Santa, the Tooth Fairy and the Easter Bunny were not real but losing my belief in Jesus was critical. It wasn’t until I was 25 years old that I came to believe in His existence again. It was Christmas time 1975 that I regained that knowledge. That year, Christmas was magical again. All of a sudden, that year it seemed that my eyes were opened to a reality that had been right under my nose for years. Instead of being all wrapped up in Santa and presents and Christmas parties (actually drunken binges), the Christmas of 1975 seemed different than any other Christmas I had ever experienced in my entire life. There were many events that led to the change in my perspective of Christmas that year, which I will not attempt to explain in this post. To put it briefly, I decided to believe in Jesus again and I was looking at the holiday as a celebration of His birthday, which, as a matter of fact, it most certainly is. Christmas has been magical for me ever since then. Although I do use a fake Christmas tree, the One whose birthday I celebrate is not fake nor pretend. And, by the way, I raised my kids pretending that Santa came with the presents but made sure they knew that it was pretend. They learned about St. Nicholas who was definitely a real person who loved Jesus and who was so generous with his gifts that the tradition of gift-giving began. Merry Christmas to all of you! I hope that Christmas was magical for you this year and will always be so for you. This entry was posted in 1960, Cape Girardeau, Missouri, School, Sprigg Street and tagged aluminum tree, Choir, Christmas, Easter Bunny, Jesus, may greene school, Santa. Bookmark the permalink. 2 Responses to Anybody Else Remember the Aluminum Christmas Tree? We’ve been compromising. We have a live tree that is small enough to drag into the living room for the season, then goes back outside in its pot around New Year’s. You can get a hint of what it looks like at the bottom of the link. 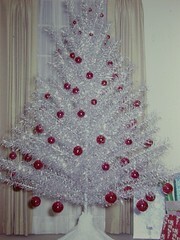 Like you Darla We had a Aluminum Tree…and I thought at teh tiem is was cool. We have had one year a PINK Flocked tree…AWWW was it COOL! Now we have a large BLACK tree at the homestead in Florida…we call it the Obama tree…it is Tall, Black and Handsome…and I love the Christmas Spirit it gives off!